Eclipse regissören David Slade, Alex Meraz (aka Paul), Boo Boo Stewart (aka Seth Clearwater), Ashley Greene (aka Alice Cullen), Nikki Reed (aka Rosalie Hale), Xavier Samuel (aka Riley) and Kellan Lutz (aka Emmet Cullen) var den 1 juli på premiären av Eclipse i Storbritannien där filmen för övrigt inte har folklig premiär förrän den 9 juli! Här kommer musikvideon till Metric's Eclipse(All Yours). Robert Pattinson är livrädd för att spela pappa i Breaking Dawn! Robert berättar om sin ångest över det kommande slutet på "Twilight"-serien, vad han tycker om att kyss scenerna mellan Kristen Stewart och Taylor Lautner, och mycket mer! What are you looking forward to about “Breaking Dawn” being shot back-to-back as two films and of Bill Condon directing them? I’m glad that it’s Bill Condon. I love his stuff. I haven’t seen the script yet but I am fearful about the series’ end. It’s such a great security blanket. It’s like a net. You can afford to make mistakes when you have another “Twilight” film to make. After that, I guess you’re on your own. I’m glad the “Breaking Dawn” films will be done together. Because otherwise, it’s quite hard to fit another film in-between each one. Like what happened in “Eclipse”—having to get your mind back to where it was before. I had about a week of preparation time. It was quite stressful in the beginning. With the two films done together, you can just stay in character the whole time. In the tent scene which is already the much talked-about thing in “Eclipse,” your vampire character is of course cold, body temperature wise, while Taylor’s Jacob drives home the point that he’s literally hotter. It’s sort of an odd scene. It’s quite difficult. It’s incredibly depressing for Edward (laughing). It does make him seem incredibly unattractive. But I never really got it in the first place. It’s like having some freezing cold person next to you (laughing). It’s horrible. Taylor told us that you were always cracking up in that scene. I think I was tired. I find all this stuff where we have to boss each other all quite funny. Considering that we’re in teen-girl magazines and stuff … Taylor always has his shirt off. And I’ve got my little quaff (laughing). We’re trying to act all macho. I thought it was really funny. Talk about the dynamics between the three of you now that Jacob gets to kiss Bella in this movie. Can you set the record straight—your Edward character is a 100-year-plus-old virgin? I think he’s … how old is he now? He must be 109 or 110. There’s an arguable point with another vampire in Alaska from the first book. It’s briefly mentioned. But I can’t remember if it’s actually fully explained if he is a virgin or not. I think the fans like to believe he is. Since these “Twilight” films are fantasy/romance/thriller dramas, may I ask which love stories inspired you? I have to sound really cheesy and say my parents. My parents met when my mom was 17 and my dad was 26. They’re still together. I grew up in an age where everybody gets divorced. But in terms of film, I’ve always liked despairing, painful love stories. I think that’s probably because I’m still young. There’s a Godard film called “First Name: Carmen.” I’m not even going to attempt to say the French pronunciation. I always found that to be one of the most truthful and inspiring love stories I’ve seen on film. How uncomfortable is it to be acting with contact lens on? You can’t feel properly. You can’t sweat. If you do anything to sweat, everything starts breaking on your face. You can’t even psyche yourself up for a scene. I don’t know how people do scenes with contact lenses on. I just find it impossible. The Edward character is about restraint and restricting yourself about everything. He’s not a very effusive person. A lot of the performance should be done with your eyes but then you eliminate that ability by putting the contacts on. Whenever I do other movies in which I don’t have to wear contacts, I breathe a sigh of relief. In “Breaking Dawn,” you become a father and Bella becomes a vampire bride. Do you have tips for Kristen on playing a vampire? Do you feel that you’re mature enough to play a dad? It’s funny because I’m playing a dad in some scenes in “Breaking Dawn” and I’m portraying one in a movie I’m doing now as well. I’m terrified about doing it. I don’t know what I’m going to do when it comes to those scenes. I’ve been complaining so much about having the makeup on and contact lenses. Kristen is like, “You’re so pathetic. You have to just get over it. Why can’t you just get used to it?” [Now, since Kristen has to wear contact lens, too], I can finally be like, “You will know what it’s like. You’re going to be in constant aggravation the whole time.” Which is great. We don’t see a lot of guys like Edward who protects a girl’s virtue. Do you relate to him at all? How old-fashioned are you? I think I’ve become more old-fashioned. I feel like I’m already turning middle-aged now (laughing). It’s quite nice to be doing a series of films that a lot of people think uphold positive virtues. Some people actually think the films are a good influence on their kids. Stephenie Meyer was on the set of “Eclipse” more often than she was on the first two movies. What was that like? It’s not intimidating. She’s really nice. She really likes the films. It was strange, though. I didn’t really notice until toward the end of the filming. I was like, “Stephenie has been here every day” (laughing). It was interesting. She’s always open. She would never really come in and push anything on us. She was open to answering questions. You have a western genre film project, “Unbound Captives,” in development. Why are you fascinated with westerns? I grew up watching westerns. My dad’s favorite movies are all westerns. I hope that film happens. It’s such a complicated film to get together because it’s not really an action film or anything. It’s a slightly depressing romantic drama, half of which is in Comanche. It will definitely be different. My character is a massive stretch for me. You play the guitar. How important is music for you? It’s really important. Incidentally, my sister is a singer and a songwriter. Acting has helped as well because I’ve never really had any particular interest. The only reason I’d start releasing records is hopefully so I get a name in music and have good people who would want to collaborate with me. I guess having a name in acting, you can get your foot through the door with quite a few musicians. I hope I’ll be able to record some stuff just for myself. The idea of selling it—as soon as you start making it—it dies in a lot of ways. It’s too scary at that point. Then everyone feels the need to judge it. But if you’re not making money and you’re doing it for yourself, then no one’s going to judge it. “Twilight” is very popular with young people, including Jaden Smith. What kind of books and music did you like when you were a teenager? I was obsessed with a writer called Martin Amis when I was a teenager. I read everything. Every single time I went to a bookshop, I’d see if he has other books. I used to buy multiple editions of his books. Martin, Van Morrison and Jimi Hendrix—they were my people when I was growing up. I’d obsessively collect all their stuff. That’s funny about how Jaden likes the “Twilight” thing. He’s like the first guy who’s willing to admit it (laughing). What has so far been a life-changing experience for you? My moving to secondary school. I was kicked out of my first school. There is a whole system of the schools in London where I went from one school to another and then to university. Everybody went to the same schools. But I got kicked out. I ended up going to an arts school which was probably the best thing that ever happened to me. MTV intervjuade Stephenie Meyer förre veckan på Eclipse premiären där hon pratar om Midnight Sun, att hon vill att förlossnings scenen ska vara hemsk eftersom det är så i verkligheten. De har knappt gått en dag och Eclipse har redan slagit rekord! 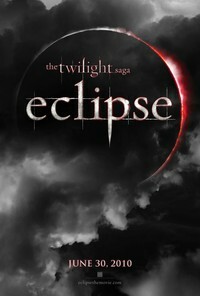 The current number for Eclipse, the third movie in the Twilight Saga franchise opening Wednesday is 4,416 theaters in North America. That passes Iron Man 2 which scored 4,380 venues. No word yet on the number of locations screening the film at 12:01 AM tomorrow. Access Hollywood intervjuade Kristen Stewart och Taylor Lautner när de befann sig i New York City.